We all know that our atmosphere has absorbed too much carbon dioxide, creating intense climate patterns around the world. Many of us also know that the oceans have absorbed a huge amount of carbon too, leading to ocean acidification and dangerous conditions for sea life (and the humans that depend on it). But did you know that soil could be the solution to some of these problems? As we dig deeper into climate science, much more is being revealed about just how powerful a carbon sink our soils can be – if they are healthy. So we all should be a little more interested in that messy substance we call dirt. Rattan Lal, Director of Ohio State University’s Carbon Management and Sequestration Center, is quoted in Yale 360: “the world’s cultivated soils have lost between 50 and 70 percent of their original carbon stock, much of which has oxidized upon exposure to air to become CO2.” But this CAN be fixed! Lal says we need to improve those degraded soils, such as those that have been overgrazed, monocropped, or have been under chemical-intensive agriculture for decades. The means of improvement include regenerative practices, like compost, planting cover crops to create green manure, soil amendments like bio char, and more permaculture practices. But we also need to ensure that existing carbon sinks like rainforests and peatlands are not degraded further (thus releasing more carbon into the atmosphere). And you can be part of the solution. The following comes to us from National Environmental Education & Training Foundation (NEEF). In their recent newsletter, they shared an article about the important connection between the health of the soil and the survival of the planet. Soil is more than just ‘dirt.’ It’s made of minerals, water, organic matter, and air, and is a living ecosystem that is vital to sustaining plant, animal, and human life. Living in this ecosystem are plant roots, bacteria, fungi, algae, mites, worms, insects, larger animals, and other organisms which function to give us clean air and water, food, forests, diverse wildlife, and beautiful landscapes. Soil does all this by regulating water, sustaining plant and animal life, filtering and buffering potential pollutants, cycling nutrients such as carbon and nitrogen, and providing physical stability and support for plant roots and human structures. A changing climate may reduce the beneficial aspects of soil through increased occurrences of wildfires, extreme precipitation, drought, early springs, and extreme heat. Wildfires have the potential to heat the soil to a level that alters its physical, chemical, and biological properties. Extreme precipitation events may erode soils into nearby water bodies and make them no longer available to support crop growth. Droughts reduce the amount of water available in soil to sustain life in the ecosystem. Earlier springs many not allow the soil to supply nutrients at required rates for faster growing plants. In turn, plants may be smaller and have reduced yields. Extreme heat increases the rate of decomposition of organic matter in soil, which increases the amount of carbon dioxide released into the atmosphere. Pick up some tips from USDA’s Natural Resources Conservation Service and learn how you can maintain healthy soil by disturbing soil less, increasing plant diversity, keeping living roots in the ground throughout the year, and keeping soil covered as much as possible. 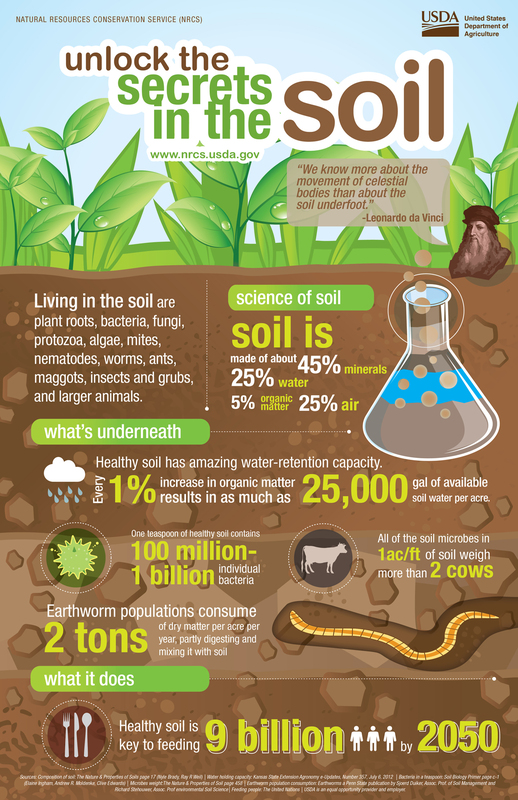 Check out this infographic from the USDA to learn more about the beneficial characteristics of soil. Tractor image from Shutterstock; soil image from NEEF.